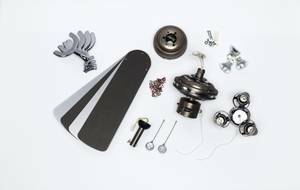 Here you will find the fitting spare parts for the Westinghouse Princess Euro ceiling fan. Please choose the needed article from the Drop Down Box that you wish to be delivered. Spare parts that cannot be found in the Drop Down Box are not available for this particular article. The fitting spare glass panel, the connection rod and the ceiling mount are available in our shop.